This week English Detective will try something a little different: examining English vowel sounds rather than a topic and its vocabulary. I’m excited about this as I just found a way to better understand and teach English vowels, especially their American pronunciations. Near the end of this email there’s also a link to a page with several interesting ways (including games) to practice English vowels. The U.S. State Department (of all places!) has a page discussing a different system of teaching American vowel pronunciations using color (and secondary) words with the same vowel sound. The chart that shows the different sounds is arranged like a linguistic chart showing where in the mouth the sounds originate. The website has links to a pdf teachers’ guide and webinar recording. It also links to the FAQs of the website of the chart’s creators , Karen Taylor and Shirley Thompson. Their site also includes a store that sells more comprehensive teaching materials, their vowel chart posters, binder copies and games for students. I really like the system’s simplicity and linguistic accuracy. It provides a way to refer to the different vowel sounds without having to learn the International Phonetic Alphabet or to rely too much on limited, inaccurate, terms like ‘long’ and ‘short’ vowels (the system I grew up with.) In the past I have found it very difficult to explain the different ways ‘ou’ and ‘ow’ can be pronounced. 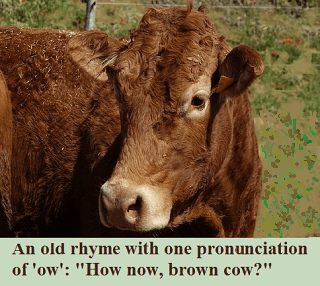 Using ‘brown (cow),’ ‘blue (moon)’ etc. is a simple, easy-to-remember system for learning and practicing the different possible sounds. FluentU offers other ways to practice vowel sounds (not using the color names system). I like the variety of games and listening and shadowing practice they suggest. Several can be practiced alone, though they also work in a classroom. I’d love to hear which activities you find most useful, if you try any of these—or if you have methods you have found helpful. You can reply at the bottom of this email. Also, please let me know if you have any suggestions to share!